The first woman to lead a major global financial services provider, Ana Botín remains one of only six women at the helm of a Fortune Global 100 company. Mrs Botín also tops the list of the world’s most powerful women outside the United States. The executive chairman of the Santander Group is the fourth-generation Botín to head Spain’s largest publicly-listed bank, a global behemoth with a market capitalisation approaching $90bn and serving more than one hundred million customers globally. She brings much more than just her family’s name to the bank. Early-on in her career, Mrs Botín was dispatched to the UK with the unenviable task to turn around one of Santander’s more troubled subsidiaries, known at the time as Britain’s worst bank. 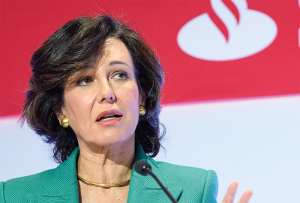 Proving her detractors wrong, and waylaying charges of nepotism, Mrs Botín reinvigorated Santander UK, achieving a corporate turnaround that is now studied and dissected in business schools the world over. Moving to the very top of the bank, Mrs Botín reapplied her magic touch by shaking up the board of directors, ushering in fresh talent, resisting the urge to grow via acquisitions, and fully embracing cutting-edge technology. The strategy already paid off handsomely with the group’s overall profits jumping 24% to $4.2bn even before Santander Spain acquired – for a single euro – the troubled Banco Popular – a move hailed as the deal of the century. That bank is now also being subjected to Mrs Botín’s now famous revitalisation routine which, though drastic, seeks to minimise the intervention’s social impact. In the case of Banco Popular, Santander significantly reduced the number of layoffs initially announced and increased the size of the compensation package offered to employees whose jobs were axed. Ana Botín’s approach to management differs noticeably from her father Emilio’s daredevil tactics inasmuch as she prefers to play the long game. In that light, Santander maintained its presence in the severely depressed Brazilian market, convinced that the country would eventually find its way out of the economic doldrums and contribute more than its fair share to the group’s profits. It proved the right bet with Santander Brasil last year representing over a quarter of the bank’s overall profit. Aspiring a career in journalism rather than banking, Ana Botín has a keen eye for detail: she repositioned Santander to boost its support for small and medium-sized enterprises (SMEs), recognising earlier than most the sector’s growth potential. She also pushed Santander to the forefront of technological innovation – becoming an innovator rather than being a follower as has been the destiny of most large banks. The approach helped protect Santander against disruptors and showed that, notwithstanding its size, the Spanish bank is able to act quickly and decisively to claim new ground. Mrs Botín has muted her critics by consistently delivering on her promises and doing so without the pomp for which her father was known. In fact, she remains surprisingly low-key and shuns the outward signs of power that are the rule, rather than the exception, in the world of high finance. As such, Mrs Botín may actually help reshape this universe.